Accusations of dual loyalty are rooted in the Jew’s historic separateness and in the conditions of Diaspora life, which was characterized by Jews being denied even the most basic rights of citizenship and acceptance. Charges of dual loyalty- a loyalty toward their religious leaders that was thought to supersede their loyalty to the state- arose as least as early as the first century in the Roman-controlled city of Alexandria, at which time a pogrom (violent assault directed against Jews) ensued. 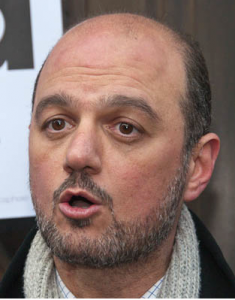 Anas Altikriti is the son of Osama Altikriti, one of the leaders of the Iraqi Islamic Party representing the Muslim Brotherhood in that country. 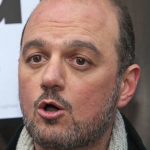 In addition to his role at Cordoba, Altikriti is one of the leaders of the British Muslim Initiative (BMI), part of the U.K. Muslim Brotherhood. The Muslim Association of Britain (MAB) had for many years been the most active organization in the U.K Muslim Brotherhood but many of the leaders of the MAB left in 2007 to form the BMI. According to an Israeli think-tank report, the breakup appeared to be the result of a conflict between traditionalists in the MAB who were unhappy with the high level of involvement in U.K left-wing politics while those who formed the BMI wished such activity to continue. I am all for the effort and struggle to free Iraq and end the occupation. I would rather that happen without any silage of blood on any side, the coalition forces or the Iraqis. If there are political avenues that are efficient and would work, then they must be exhausted. However, to expect to rule people with guns and missiles and not expect a reaction in kind is extremely foolish and naive. Also, to occupy a people and expect them not to retaliate is also unrealistic. Even the United Nations recognizes the right of an occupied people to free themselves using any means and methods, and the Iraqis aren’t exempt from that liberty. However, my wish is that not one single Iraqi is killed, not one single American or British soldier is killed…and Iraq is freed from occupation. If that can be achieved, then I’m all for it. In an interview in June 2006 on the Egyptian Muslim Brotherhood website, Altikriti called upon “the Iraqi resistance” to “refrain from killing for the sake of killing but only to resist the occupation”. He reaffirmed “the right of the Iraqis to engage in legitimate resistance against foreign occupation abiding by the international laws and traditions”. Al Tikriti also lashed out at the occupation forces accusing them of being the real cause of destruction in Iraq and killings of the Iraqi people “It was the occupation in the first place which opened the doors for Al-Zarqawi or the Badr Brigades (Shiite militia) which kill the Sunni scholars on a daily bases. It was also the same ugly occupation and through its horrific actions in Abu Gharib and the massacres in Haditha and Ishaqi, that caused some Iraqis to sympathizes with Al-Zarqawi and those like him” Al Tikriti called upon members of the Iraqi resistance to embolden its true patriotic image before the world and refrain from killing for the sake of killing but only to resist the occupation. He concluded by reaffirming the right of the Iraqis to engage in legitimate resistance against foreign occupation abiding by the international laws and traditions.